Do you have ancestry in the Queensland mining industry? 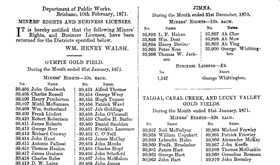 This database indexes the lists of Goldfields Miners Rights, Business Licences, etc. which appeared in the Queensland Government Gazette between August 1870 and November 1884 (after this they appear not to be listed in the Gazette). The database has 42,474 entries including many women. Though many evident errors occur in both the names and licence numbers in the published lists, the entries have been indexed exactly as they appear. It would be wise to check back to the original lists as sometimes the sequence of numbers will indicate a recording error in the licence number and suggest the correct number. Many surnames occur with a variety of spellings. "What can I find out about my ancestors in these records?" So, if any of your ancestors were miners, this genealogy tool is an absolute must for anyone exploring their family history or building a family tree!